Bring glorious colour to your life with this amethyst and diamond pendant. 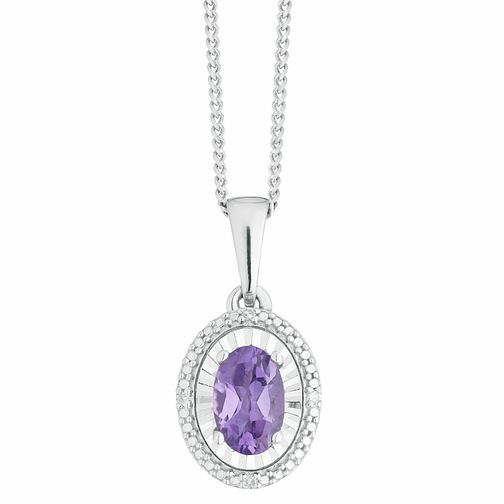 Styled in shining sterling silver, this gorgeous pendant features an oval cut solitaire amethyst stone and is surrounded by a delicate halo of round cut diamonds, creating a uniquely colourful style perfect to accessorise any outfit. Sterling Silver Amethyst & Diamond Oval Pendant is rated 5.0 out of 5 by 2. Rated 5 out of 5 by Anonymous from Christmas gift My Girlfriend is delighted by it and its on constantly with the Earrings.